Our first concert of the season falls on Armistice Day, one hundred years on from the end of World War I. The programme features music that explores composers reactions to conflict and their experience of war. Vaughan-William’s Pastoral Symphony is an elegy to the dead of the Great War and Britten expresses his life-long pacifism in a work composed in the midst of World War II. 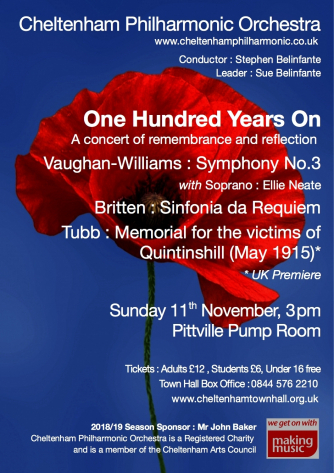 We are delighted to present a work by Gloucestershire based composer Alf Tubb which is a memorial to those that died in the Quintinshill rail disaster in May 1915. Join us for an afternoon of wonderful music, reflection and remembrance.